Okay, so most people configuring UCS are doing so with 10 Gbps links. Say, however, you are (not so) patiently waiting on budget approval for that 10 GB blade and you have a sad that your shiny UCS is collecting dust. Cheer up, my friend, you can use 1 Gbps connections to bring that chassis online. 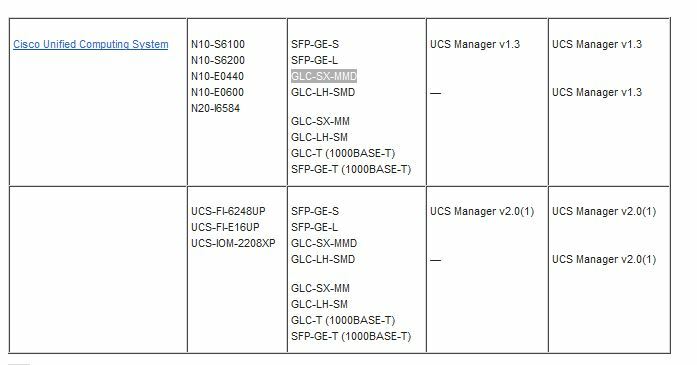 *if you refer to the Data Sheet for the 6200 Series Fabric Interconnects found here you won’t see the GLC-SX-MMD listed. My VAR sent me over the screen shot below to assuage my fears after TAC initially told me the SFP wasn’t supported. I have yet to locate the original doc on Cisco’s website, if you have a link, please feel free to post it. Thanks! I missed it on this chart, see it now! Thanks again! Don’t forget if you’re using the old 6100 series FIs that (depending on the model) only the first 8 or 16 ports can be set to operate at 1Gbps. Very good point I learned and should have mentioned! Thanks for bringing that up! !